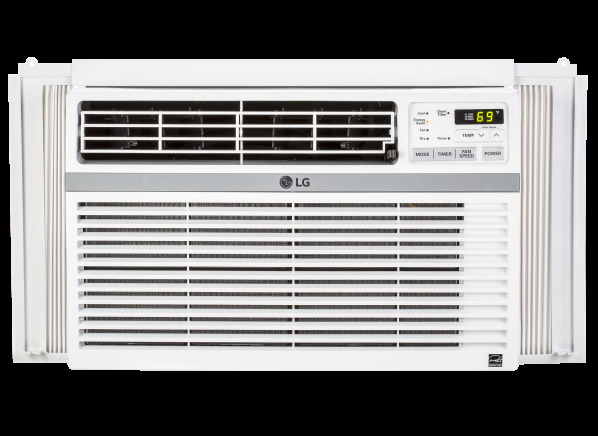 The LG LW8016ER is part of the Air conditioner test program at Consumer Reports. In our lab tests, Air conditioner models like the LW8016ER are rated on multiple criteria, such as those listed below. Comfort: How quickly the air conditioner on its low fan setting cooled a room sized for the particular unit and how accurate it came to meeting the temperature set point. Indoor noise low: This judgment of indoor noise at the low-cool setting is the objective measurement of noise level using a sound meter. Indoor noise high: This judgment of indoor noise at the high-cool setting is the objective measurement of noise level using a sound meter. Results in the following chart are gathered from Consumer Reports’ 2018 Summer Survey of 5,249 window air conditioners, owned by members who purchased a new unit between 2008 and 2018. Our predicted reliability ratings are based on a statistical model that estimates breakage rates within the first 4 years of ownership, for air conditioners that are not covered by an extended warranty or service contract. We also adjust for the median number of months of use per year. The median in our survey was 4 months per year. Higher ratings are indicative of better reliability. Brands receiving a red or orange rating cannot be recommended by CR at this time. Our owner satisfaction ratings are based on the proportion of members who are extremely likely to recommend their air conditioner to friends and family. Remote control Remote control Much like the remotes for home-entertainment devices, these wireless devices control almost any function on the unit. They're especially useful if access to the air conditioner is limited, as when the unit is mounted through the wall at ceiling level. The remote generally works well anywhere in a room, although some may not work as well when they're used far to one side of the air conditioner. Electronic control with built-in timer Electronic control with built-in timer A growing number of air conditioners now have electronic controls. Much like the digital thermostats for heating systems, these can (fairly reliably) hold the room at a certain temperature, shown on a digital display. Many also include a timer feature that allows the user to set an "on" or "off" time--great for, say, having the air conditioner activate automatically to cool a room before you return home from work. Auto fan speed Auto fan speed This feature automatically varies fan speed according to differences between room temperature and the thermostat setting. When the difference is wide, the fan runs at higher speed; when the gap is more modest, the fan runs more slowly. The speed will change automatically as needed, to respond to changes in selected setting or room temperature. Dirty filter indicator Dirty filter indicator This indicator light or flag signals when the filter needs cleaning. It's usually triggered after a certain number of hours of operation have elapsed on the internal clocks in electrical control models. Flag-type indicators can activate in the event that dirt and debris blocks the filter. Directional control Directional control Indicates which direction the air conditioner blows cool air best. Direction given is when facing the unit. "Even" means that the unit was equally capable blowing cool air in either direction. Btu/hr. Btu/hr. The unit's cooling capacity, as supplied by the manufacturer (and as certified by the Association of Home Appliance Manufacturers, AHAM, unless otherwise noted in the Recommendations & Notes). Capacities range from 5,000 British thermal units per hour (enough for a modest-sized bedroom) up to 12,500 Btu/hr. (adequate for a large, sun-drenched room or even two interconnected rooms). EER EER The energy-efficiency rating, as supplied by the manufacturer (and as certified by the Association of Home Appliance Manufacturers, AHAM, unless otherwise noted in the Recommendations & Notes). The higher a unit's EER, the lower its operating cost compared with other models of its size. Min window width (in.) Min window width The minimum and maximum window-widths into which the air conditioner will fit. If your window opening is narrower than the minimum width, the air conditioner will not fit. If your window opening is wider than the maximum width, the side panels will not cover the entire opening. Max window width (in.) Max window width The minimum and maximum window-widths into which the air conditioner will fit. If your window opening is narrower than the minimum width, the air conditioner will not fit. If your window opening is wider than the maximum width, the side panels will not cover the entire opening. Weight (lbs.) Weight In general, smaller-capacity models are lighter, while larger-capacity and some high-efficiency models tend to be heavier. Slide-out chassis Slide-out chassis A feature usually found on larger and heavier models, in which internal components are mounted on a chassis that's removed from the outer enclosure (cabinet) through the front face (grille). The cabinet must be installed into the window opening before the chassis can be slid into place. That makes for a more secure but slower installation, and for easier access to components requiring service and maintenance. Min window height (in.) Min window height The minimum window height into which the air conditioner will fit. If your window opening is shorter then the min height the air conditioner will not fit. Exterior support bracket with leveling provision Exterior support bracket with leveling provision This provides additional support for the air conditioner, which otherwise is held in place only by the window's upper sash. The bracket's angle can be adjusted to the particular windowsill and to allow condensate to drain properly.